Hatonuevo (in English: New Herd) is a town and municipality of the Colombian Department of La Guajira. It was founded on 20 October 1840 by Blas Amaya and became a municipality in 1994. The flag of Hatonuevo is horizontally divided green-white-black. "Uldaris Palmesano, a lawyer native from Hatonuevo and contributor to his village's progress and prosperity, when appointed first Mayor of Hatonuevo, decided that the village he had contributed to upgrade to a municipality needed a proper symbol. It was decided to adopt a tricolor flag, while the municipalities in the department of La Guajira are usually represented by bicolor flags. Green recalls harmony and spiritual peace, as well as the natural environment of the municipality. White also honours peace, the product of friendship and the kindness of the villagers. Black represents the main source of income for the municipality, coal." The "corregimiento" of Hatonuevo, part of the municipality of Barrancas, was granted municipal status by Departmental Decree No. 057 on 9 November 1994. On 5 November 1998, the Decree was nullified by the State Council. 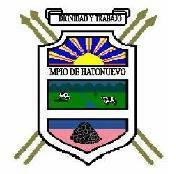 Hatonuevo was eventually granted municipalstatus by Departmental Decree No. 001 on 14 January 1999. Thirty percent of the territory of the coal mine of Cerrejón (see Albania) is located in Hatonuevo.